Copyright © 2017 Alex Liska. All rights reserved. 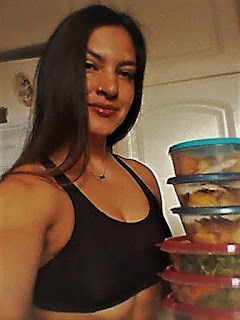 I decided to post an update on my training and nutrition... As of just recently I e-mailed my coach (Mindi O'Brien) to start training again! The difference with this time is that I'm not sure if I'll be training for a show or not, but either way I want results, change and structure! Not to say that I have no idea how to eat properly or workout LOL but sometimes it's better to have an experienced coach designing my meal plans and workouts in order to avoid over thinking or second guessing myself! Mindi also seems to always find ways to destroy my muscles while keeping the plans exciting! I just finished prepping my first set of meals; I had been eating very similar foods to what is on my new plan but there are a few changes such as pineapple and chicken breast :D and a steak (I LOVE RED MEAT) !!!!!!! Looking forward to a fun and un-boring summer !!!!!! !